June’s strength of character was forged by living in the wilderness west of Turner Valley as a young girl with her mother and her stepfather, Tip Johnson, a renowned cowboy and horse trainer. She learned early to live in harmony with her environment and became a strongly determined woman capable of meeting the challenges of being an artist, horseback guide, businesswoman, wife and mother. As the only child of a single mother, June saw early years that were marked by loneliness but also by close family ties that defined how she would chart her adult life. As well, it led to a love of horses that played an essential part of her life right up until her death at the age of 91. 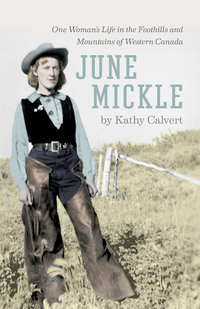 Her life with Bert Mickle, the son of a long-established ranching family, was unconventional. It is a love story of two people coping with family struggles and a precarious existence that had tremendous rewards and hardships. June’s strength of character held her family together despite unforeseen tragedies. Kathy Calvert grew up in the Canadian Rockies. In 1974 she became one of the first female national park wardens in Canada; in 1977 she was a member of the first all-women expedition to Mount Logan and in 1989 was on the first all-women ski traverse of the Columbia Mountains from the Bugaboos to Rogers Pass. She is the author of three books: Don Forest: Quest for the Summits (RMB 2003), Guardians of the Peaks: Mountain Rescue in the Canadian Rockies and Columbia Mountains (RMB 2006) and June Mickle: One Woman's Life in the Foothills and Mountains of Western Canada (RMB 2015). She and her husband, Dale Portman, live in Cochrane, Alberta.